NOAA Fisheries has approved measures of the New England Fishery Management Council’s Omnibus Essential Fish Habitat Amendment 2. This amendment updates the Essential Fish Habitat designations required by the Magnuson-Stevens Act with the latest scientific information, and minimizes the effect of fishing on that habitat while balancing the economic needs of the fishing industry. • Establishment of two Dedicated Habitat Research Areas, seasonal spawning protection measures, and a system for reviewing and updating the proposed measures. The approved measures are effective on April 9, 2018. Closed Area I North will remain closed until April 15 to protect spawning. This closure applies to all fishing vessels, except vessels in transit, vessels fishing with exempted gears, vessels fishing in the mid-water trawl exempted fishery, charter and party vessels, private recreational vessels, and scallop dredges. The Spring Massachusetts Bay Spawning Closure will be closed April 15-30. 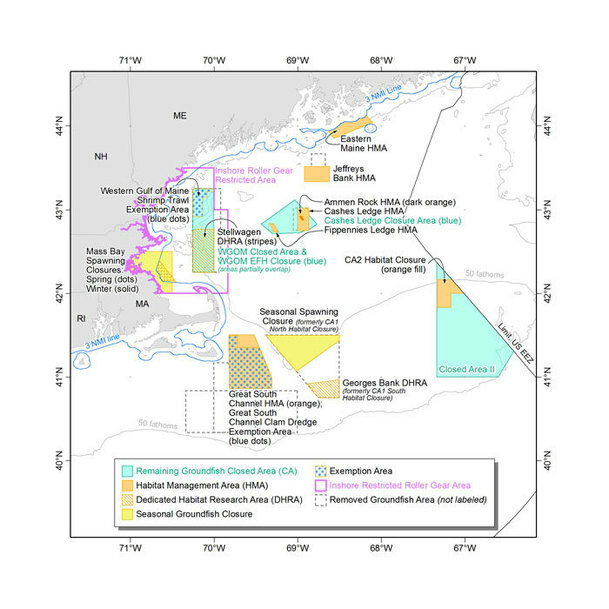 This closure applies to all vessels, except vessels without a federal northeast multispecies permit fishing exclusively in state waters, vessels fishing with exempted gears or in the mid-water trawl purse seine exempted fishery, scallop vessels on a day-at-sea, scallop vessels in the dredge exemption area, transiting vessels, and charter/party and private recreational vessels. For more information, read the permit holder bulletin. Also, see the map of the final approved habitat areas below. The dashed lines show the boundaries of the existing closed areas and habitat closures. Fishing Industry: Moira Kelly, Regional Office, 978-281-9218 or David Stevenson, Regional Office, 978-281-9118. NOAA Fisheries announces squid and butterfish quotas for the 2018 fishing year and projected squid and butterfish quotas for the 2019 and 2020 fishing years. We will maintain the mackerel quota previously set for 2018. Based on the status of these stocks, we are reducing the 2018 commercial butterfish quota by 41 percent compared to 2017, and increasing longfin squid quota by 2 percent. Annual quotas for Illex squid remain at current levels, in effect since 2012. A March 2017 butterfish assessment update indicated that recent low recruitment may soon reduce biomass below target levels. Assuming average recruitment in future years, butterfish quotas would increase in 2019 and 2020. As new information becomes available, we may revise these projected quotas. Read the final rule filed today in the Federal Register and the bulletin sent to permit holders. NOAA Fisheries announces adjustments to the 2018 annual catch limits (ACLs) for the Atlantic herring fishery to account for carryover of unharvested catch from fishing year 2016. Catch information for fishing year 2016 shows that sub-ACLs Areas 1A, 2, and 3 were under harvested and that the overall 2016 stock-wide ACL was not exceeded. Therefore, we are increasing the Area 1A, 2, and 3 2018 sub-ACLs to include the carryover of unharvested catch from the 2016 fishing year. The stock-wide ACL is not increased by this action and is less than the sum of all four sub-ACLs. The 2016 Area 1B sub-ACL was exceeded. Therefore, we are deducting this overage from the 2018 Area 1B sub-ACL. For more details, please read the rule as filed in the Federal Register, and our permit holder bulletin. The report is available as a pdf on our website. If you would like a printed copy, please contact Allison Ferreira at allison.ferreira@noaa.gov or 978-281-9103.